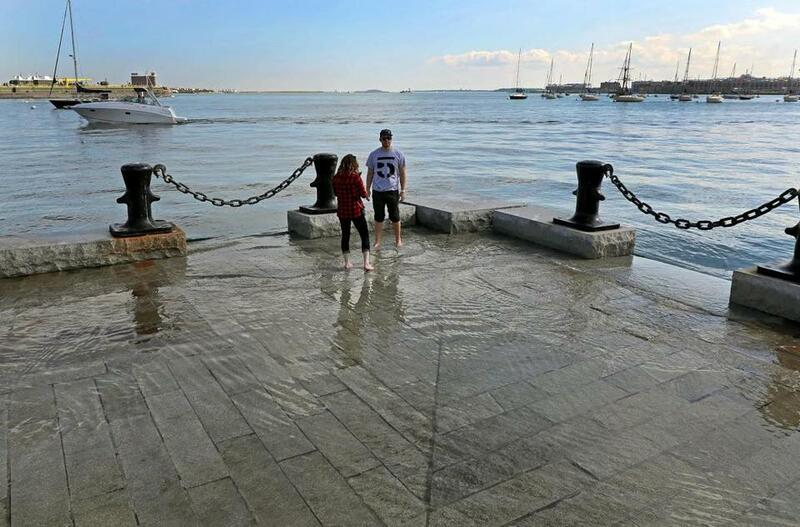 The scene was redolent of summer, at a time when many people are planning their Halloween costumes: unshod tourists dipping their toes into Boston Harbor near Long Wharf. The visitors could enjoy the rare unseasonable frolic because the highest tides of the year in Massachusetts rolled in Monday. Called King tides, they occur when the moon is closest to the Earth and the Earth is at its closest point in its orbit around the sun. The tides will remain through Wednesday. Andrew Dzurovcik of Chicago, seemed perplexed as he surveyed the scene with Meghan Ohagan. The couple said they had never seen a tide like this. “We weren’t sure if it was normal or not,” Ohagan said. 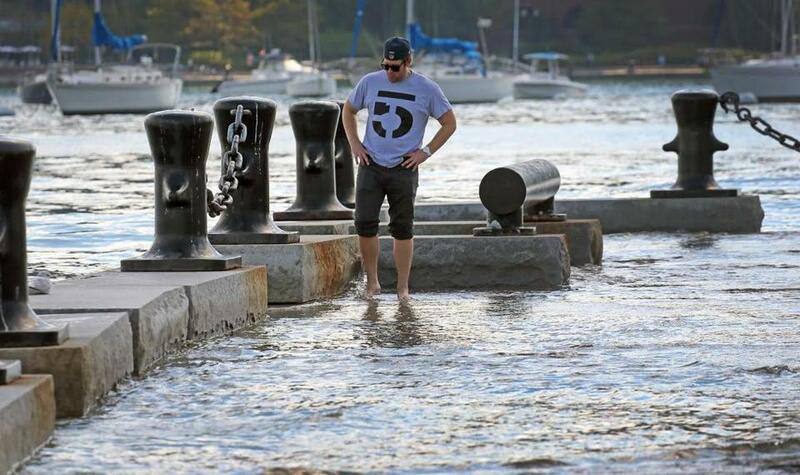 Andrew Dzurovcik was visiting Boston from Chicago when he spotted the high tides at Long Wharf. Dzurovcik lowered a foot in the water and declared it refreshing. “It cools you down on this 70-plus degree day,” he said. Northward along the harbor, the higher tides provided a more serious backdrop. A neighborhood group rallied against plans to erect a new hotel on Lewis Wharf, amid warnings that climate change is raising sea levels. By early Monday afternoon, water was covering the pilings behind Lewis Wharf, where a developer wants to build a 277-room hotel on the little-used end of the wharf. The group Save Our North End Waterfront says the hotel would ruin access to the pier for residents. Dzurovcik carried Meghan Ohagan, also from Chicago, on his back through the water. Peter Shelley, senior counsel at the Conservation Law Foundation, said at the rally held at Lewis Wharf that the tide levels make the controversial hotel dangerous. The state Department of Environmental Protection has ruled that developers could not build the proposed hotel on wharves, piers, or pilings that are submerged in water at high tide. The move means the developer will likely have to revise the project. 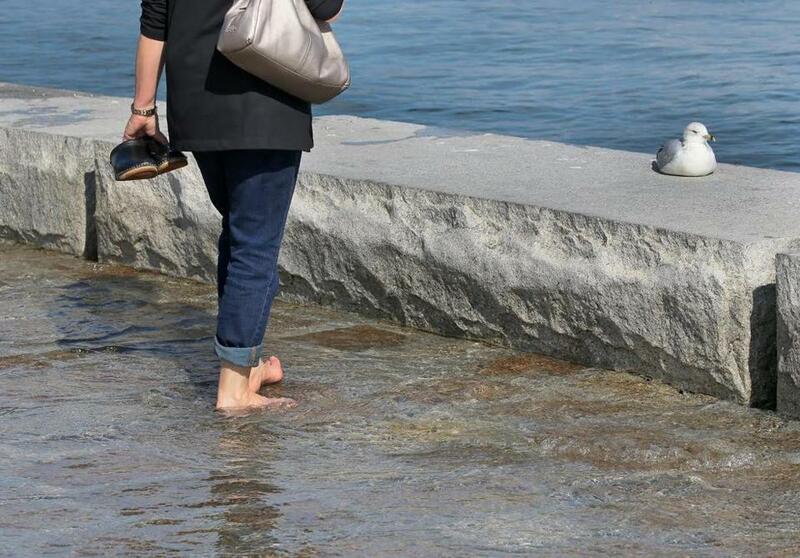 Gail Garrett, who was visiting Boston with her husband from upstate New York, waded through the water barefoot. 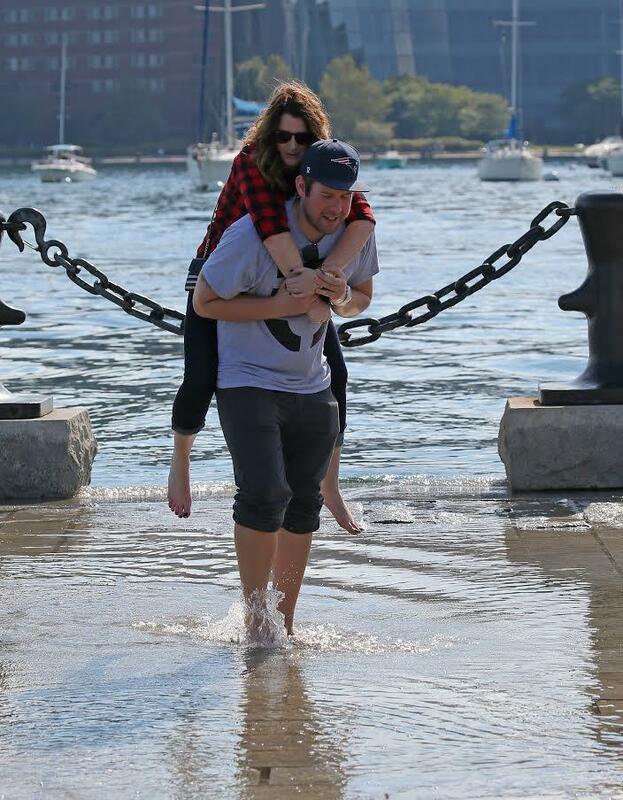 Dzurovcik and Ohagan said the high tides were a way to cool off while Boston experienced weather in the 70s.